Nonprofit, community-based housing development organizations have only recently become significant players in the provision of affordable housing, at least in the United States. Historically, this job was left either in the hands of builders, developers, lenders and landlords of the business sector or in the care of agencies, planners and policymakers of the public sector. Only in the past 30 years has the provision of affordable housing moved beyond the familiar domains of the market and the state. A host of nonprofit organizations is now playing a larger role in constructing new housing, rehabilitating older housing, managing rentals and bringing home ownership within the reach of thousands of people for whom the American dream has proved elusive. The growth of these third-sector organizations has been both rapid and impressive, but it also has been uneven. Across the country, there are places where nonprofit housing development organizations are both plentiful and productive, supported by sophisticated networks of interorganizational collaboration, public funding, private financing and technical assistance. There are many other communities, however, where no nonprofits are engaged in affordable housing or where the ones that do exist are very new or very small, accounting for only a handful of new housing units every year. Lying between these two extremes are those communities where multiple nonprofits of varying size serve a similar geographic area, each producing a modest but respectable number of housing units; each competing for constituents, funding and development opportunities; each struggling to survive. The organizations that find themselves in this uncomfortable situation often confront a special set of challenges. They are productive, but not prolific. They are effective, but not efficient. They are successful, but not sustainable. Indeed, they are frequently quite precarious. The loss of a single staff person, the delay of a single project or the adverse decision of a single funder can threaten not only their short-term chances for success, but their long term prospects for survival. Those who sponsor and fund such organizations sometimes find themselves in a situation where competition among multiple nonprofits is weakening them all. In these cases, the sponsoring and funding organizations have taken different tacks to address this problem. In some cases, they have acted to strengthen every nonprofit, while working to increase the division of labor or the division of territory among them. In other cases, they have acted to strengthen one (or more) nonprofit at the expense of the others, culling weaker performers from the herd. While these have been the most common approaches for dealing with the weaknesses that organizational competition and duplication can sometimes create, a third alternative has been gaining ground. Multiple nonprofits, operating within the same jurisdiction, are being encouraged to collaborate -- even to the point of merging their programs, assets and hard-won identities. Why is collaboration gaining in popularity? A financial explanation would be that it is becoming harder to find enough resources to strengthen every nonprofit to the same degree, funding multiple nonprofits to serve a similar clientele in the same locale. There is also the political reality that public and private funders find it difficult to choose easily (or accurately) which nonprofits should live -- and which should die. There is a practical explanation as well. Collaboration is becoming a strategy of choice simply because it is proving to be an unusually effective way of achieving greater productivity, efficiency and sustainability. When a collaborative (or a merger) is carefully crafted, the nonprofit partners do a better job together than they did apart. This is not true in every case, of course. 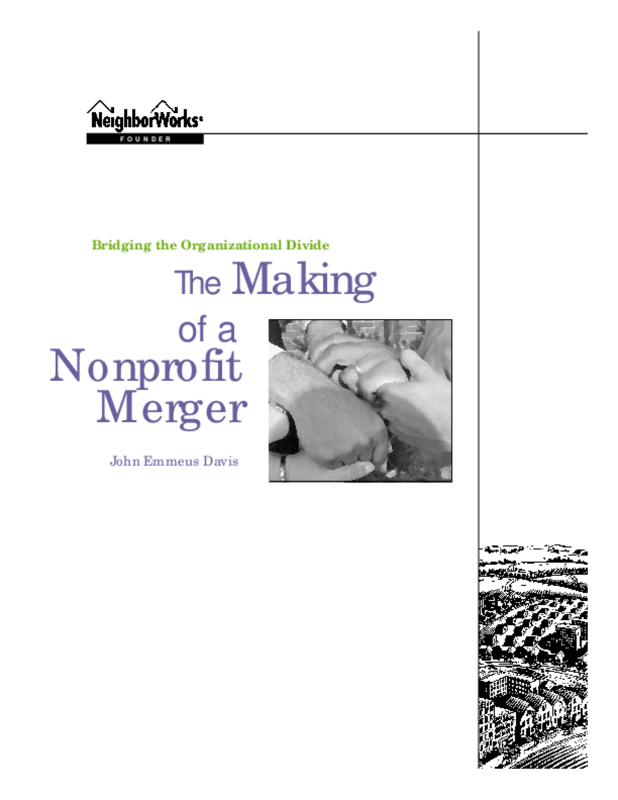 Read the full report for lessons in organizational matchmaking and the making of a nonprofit merger.